Build green with naturally beautiful bamboo. The perfect solution for eco-friendly resorts, Bamboo Living has perfected the first and only ICC-ES building code certified bamboo prefab homes and buildings. Strong and safe, all our carbon negative bamboo structures surpass the toughest hurricane standards of the U.S., are termite and pest resistant, and have the tensile strength of mild steel. Past clients include theme parks, spas, surfing resorts, yoga retreat centers, meditation sanctuaries, temples, restaurants, and family centered nature compounds. Choose from our easy to assemble existing models, or work with the Bamboo Living architectural team to realize your unique creative vision. Generate Biogas from kitchen waste and organic waste in your resort. Use Biogas for cooking, replace fossil fuels and save 20%-40% in fuel costs. Dominica Eco Lodge / Hotel Accommodation, Sustainable ecotourism best practice guest speaker, greening hotels consultant and environmental education. This is the future of green boating. 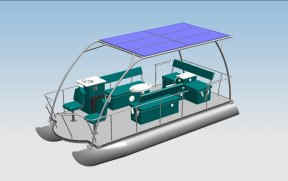 Introducing the Loon, the world’s first solar-powered recreational boat! It seats 8 people and is perfect for touring protected waterways without any emissions or burning expensive, non-renewable fossil fuels. Below is an image of this incredible green boat. For eco lodges that want to take the next step in sustainability. Please Contact Us if you have Eco Resources for hotels.